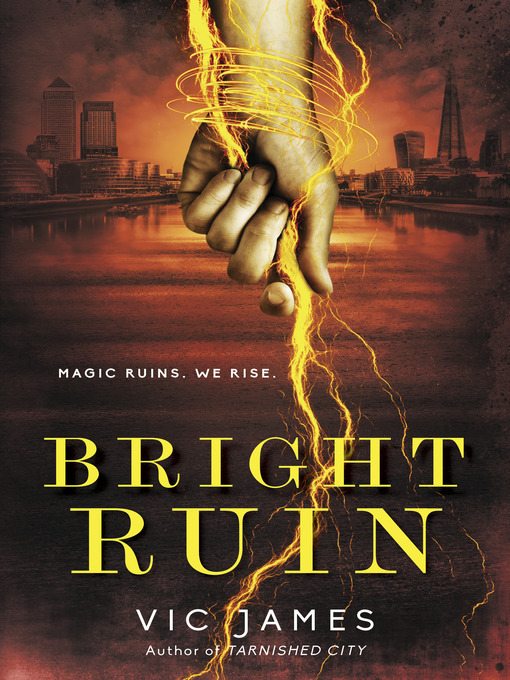 In the "thrilling conclusion"* to the dystopian trilogy that began with Gilded Cage and Tarnished City, the people of Britain rise up against their magically gifted masters. They must break the system—or be broken. The rules are simple, the system cruel: the lower classes must give ten years in service to Britain's powerfully gifted rulers. With one uprising crushed by the glittering elite, commoners and aristocrats alike now take sides for a final confrontation. "You're awake!" said a voice as Abi opened her eyes. Daisy leapt onto the bed and hugged her. "You've slept till teatime." "I don't usually wake up to an audience." "You see," Gavar Jardine said to the woman next to him, "I told you she'd be back to her usual self." The old lady smiled, and her face was full of kindness, which was when everything came back to Abi in a rush: Gavar pulling her from the wreckage of Gorregan Square. The motorbike ride. This house in the countryside, lived in by Gavar's old nanny, his little daughter, Libby—­and, just as he had promised, Daisy. The disbelieving joy of seeing her sister again. Abi had taken a boiling hot shower and scrubbed off the filth and blood of Gorregan Square. But she hadn't been able to scour away the bone-­deep stain of witnessing people ripping like animals at someone who was helpless to resist—­whatever his alleged crimes. Nor could she purge the breath-­stealing terror of knowing she was next. Worst of all was the hollow ache in her chest at the memory of Jenner's betrayal—­promising her safety, then turning her over to his father. Despite her escape from the crowd's knives at the Blood Fair, something had been torn out of Abi after all: her heart. She hadn't been able to control her tears, until this old woman had appeared at her shoulder with a soft, laundered nightdress, a mug of chamomile tea, and two sleeping tablets. "Thank you," she said, looking over her sister's shoulder at the old woman. Mrs. Griffith was her name. "That was just what I needed. And thank you for having me in your home." "Don't thank me," said Griffith, her lined face crinkling. "Thank Master Gavar." Abi turned to Gavar. That proud face and the size of him were as intimidating as ever, but his expression wasn't the blank hauteur to which she was accustomed. In his arms, he held his little daughter. "I'm not sure I've the words for that," Abi said eventually. "You didn't just rescue me. You saved all of us by putting a stop to the Blood Fair." Abi felt her sister's arms tighten around her. The heir of Kyneston ducked his head. "It was what anyone would have done." "But no one else did. Only you." "Well." Gavar cleared his throat. "Griff has found some clothes for you. Then come downstairs for some food and we can talk about what's next." When they'd all trooped out, Abi washed and pulled on the skirt and frumpy cardigan Griff had laid out. She looked in the mirror and saw the mass of hair extensions with which she'd disguised herself. She knew how. She had fed herself with fairy tales. All those novels about handsome Equal boys—­Jenner had walked straight out of their pages, his Skillessness a tragic flaw that only made him more vulnerable. More lovable. What a fool she'd been. She wasn't "back to her usual self" after finding refuge and having a few hours of sleep. She never would be again. That Abi had died in Gorregan Square, betrayed by her own romantic illusions. Abi forgave her past self for her naivety, but wouldn't mourn her. 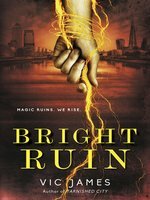 Vic James is the author of Gilded Cage, which was shortlisted for the Compton Crook award and was a World Book Night 2018 pick, and its sequels Tarnished City and Bright Ruin. A current-affairs TV director who loves stories in all their forms, she has covered the 2016 U.S. presidential election and Britain's EU referendum for BBC1 and has twice judged The Guardian's Not the Booker Prize. She has lived in Rome and Tokyo, and currently lives in London. James wraps up her big-hit trilogy, begun with Gilded Cage and Tarnished City, about an alternate contemporary Britain where the lower classes are forced to serve a magically gifted upper class for ten years. Rebellion comes to a deadly boil in the final chapter of James’s Dark Gifts alternate history fantasy trilogy (after Tarnished City). In this alternate contemporary England, aristocratic equals with magical skill rule over the unskilled, relying on intimidation and outright slavery to keep businesses humming. The powerful Jardine family has maneuvered its way into claiming the all-powerful Chancellorship for the heir, Jenner, even though he’s unskilled. Jenner’s ambitious wife, Bouda, and his father think they’ve found a way to restore his skill, but first there’s the threat of a slave uprising to quell. As Bouda secretly schemes to build her own power, James weaves in side plots about a legendary Wonder King and the origins of skill, as well as the story of a young enslaved woman determined to avenge her family. With so many characters and subplots in motion, new readers may have trouble getting up to speed, but a little patience will be rewarded with this intricate tale of ruthless scheming and bloody betrayals backlit by an unquenchable glimmer of hope. Agent: Ginger Clark, Curtis Brown, Ltd.